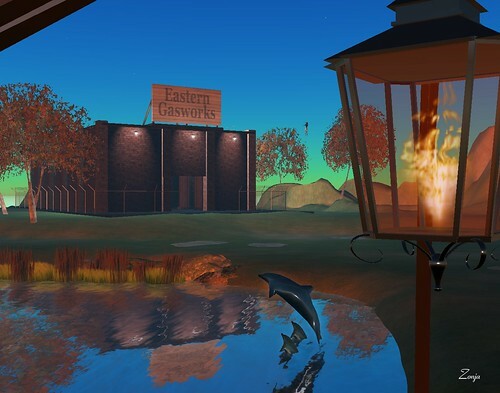 Recently, the page about performance in the Opensim wiki has been extensively updated, and this prompted me to gather some data for Condensation Land, a mini virtual world powered by Opensim which I administer, to be able to add this data to the page. Condensation Land is special in the sense that while it’s a quite small, home-based, world, at the same time it hosts a relatively big number of prims and scripts, and I thought that adding that data to the page might end up being useful to somebody. When collecting the data I had to visit all the islands, one by one, and this made me remember the story of Condensation Land, how it all started, the things we did there, the people who have contributed wonderful stuff to be displayed, and I thought I’d write a blog post listing and commenting detailedly the technical data I had gathered, and at the same time giving an account of the history of the mini-world. Condensation Land started as an experiment in looking for alternatives to Second Life after the OpenSpace fiasco. The initial six months of this process are explained in detail here. Shortly after writing this article, the company I was working for decided that virtual world technology was not adequate for their needs and started using WebEx. The initial founders of Condensation Land (Ludmilla Writer, Favio Piek and myself) decided to keep Condensation Land as an experiment and a playground, and to invite people to show their content in the mini-world. 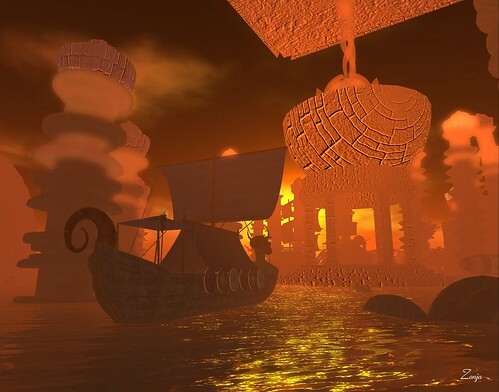 Condensation Land is a mini virtual world powered by Opensim. We are using r13558 of the Diva distribution (D2); the Wifi page can be accessed here. Condensation Land has a WordPress blog, used mainly to keep users informed of new releases and content additions, and a Flickr group. The whole Condensation Land virtual world runs on a non-dedicated home machine with Windows XP SP3, 3 GB of RAM, and two SATA ST3400620AS HD’s of 372 GB each. The first HD (C:) hosts the operating system and the swapfile, while the second HD (D:) is dedicated to Opensim and MySQL. Apart from keeping the system updated and running the disk defragmenter every so often, the machine requires almost no maintenance. Networking is provided by JazzTel (a spanish ISP) in the form of a symmetrical 2 Mb SDSL line; the machine has an external IP address and can thus be used for HyperGrid teleports, accesed from anywhere, etc. This line costs around € 200/mo, which is more or less US$ 250/mo. Condensation Land (loginuri: http://condensationland.com:9000) comprises 11 regions, of which 10 are public. The region with most prims is Condensation Land, with 10,278 prims, and the region with more active scripts is Angelico Miguelis, with 706 active scripts. The whole world uses 38,065 prims and 1,934 active scripts, as detailed in the following table. MyWorld.ini sets CombineContiguousRegions to false to avoid the use of megaregions. The bin\library directory contains the default IARs shipped with D2, plus the large objects library downloadable from the D2 downloads page, plus some small animation IARs created by myself with freebie anims found elsewhere. I’ve not had time to set up default avatars for male, female and neutral preferences. 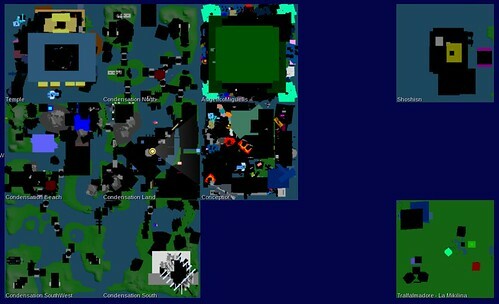 Opensim.exe is pretty stable. and oscilates between 0% and 10% of CPU usage (even when idle, there are a lot of scripted objects, and object status has to be saved frequently), and uses between 167 MB when idle to 512 MB with one avatar and 1 GB of RAM with some few avatars. MySQL.exe consistently uses 250-300MB of RAM, and MySQL backups (in .sql format) occupy 3.51 GB, 1.32 GB when zipped. and an exhibition called Mirror Worlds featuring pictures from Florence Babenco, Ludmilla Writer, Mikil Tiki, Monika Finchy, Senna (SennaSpirit Coronet), Shoshisn Shilova and myself, and sculptures by Shoshisn Shilova. which you should absolutely visit (or, at least, look at the videos and pictures here). Nice post Zonja, very interesting to read what you’ve been getting up to. Thanks! :-) What’s nice is that as hardware gets more powerful and cheaper, and the same happens with bandwidth (we’re about to get 50Mb/5Mb FTTH lines in Barcelona pretty soon, that’s 2.5x the upload b/w we have now for a quarter of the price), one can envisage having a home-based middle-sized world (say, 50 regions) with 20 simultaneous avies at almost no cost in a few years. Nice post, great to see how this works in practice! How do you like the Wifi interface? Was it easy to setup? Does it work well? Wifi is very simple to configure — you reply to a set of questions, and you forget about it. In my case, I was migrating from r12274 and I wanted to merge-config from a clean install (sometimes there are new config variables in a Diva distro and these are not included automatically when you migrate, so I wanted to make sure that I got all the latest bells and whistles). That’s it. I elected to review new account creation (I imemdiately grant account creation to people I know, but not to people I don’t know and who haven’t contacted me), and to use gmail to send notifications. Wifi sends quite terse but informative enough messages to the user and the admin when a new account is created. Once configured, it’s an install-and-forget feature. It includes a very simple user admin interface, which I’ve used to delete the gazillions of “First Last (SL Grid)” dummy users from the time we were using justincc’s Parallel Selves Message Bridge. There’s also an embryonic inventory manipulation program, which at the moment only allows for deletion of items, but which shows a lot of potential. I think Diva is working on a region/estate tool — this may be super-useful to simplify estate management, which at the moment is a pita and has to be done manually. As for how it works, for me it works perfectly. When a result set is large (for example, if I try to display my 6500+ items inventory, or when I tried to list the now deleted 600+ PSMB pseudo-users) the page takes time to load, for obvious reasons. Apart from that, it works flawlessly. I see a lot of potential in Wifi; to be more general, I see a lot of potential in small html applications served directly from opensim itself. Oh, and since after all we’re running WAMP, I took the time to program an Apache reditect, so that people going to http://www.condensationland.com land in the Wifi page instead.